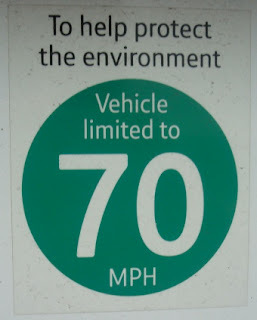 How will BT react to an 80mph speed limit? Given that this sticker is on a number of BT's vans for environmental reasons I trust it won't be changed to 80 if the speed limit changes. Will the VNEB Planning Framework postdate the decisions? 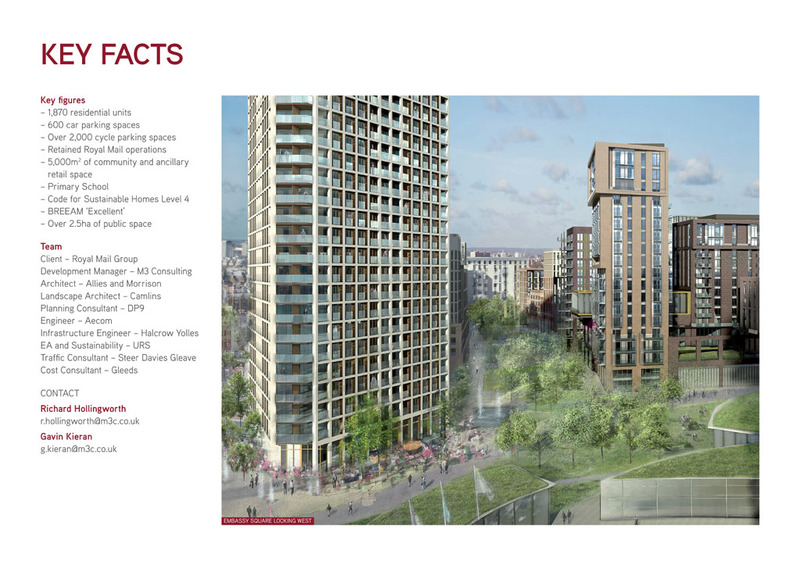 I'm starting to believe that the Vauxhall, Nine Elms, Battersea Opportunity Area Planning Framework will only be published once all the mega schemes have had planning approval. I've no idea whether the feedback that I and other members of the public made to the draft have been incorporated and what the big vision is. It doesn't make commenting on plans any easier. 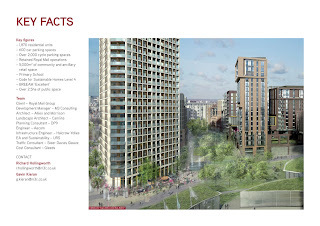 Anyway, the latest scheme to be seeking consent before the Planning Framework is finalised is Nine Elms Parkside. 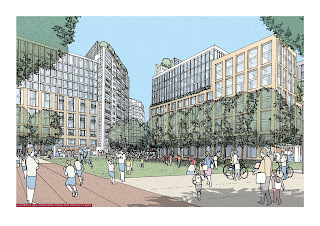 The site is the former Royal Mail site off Nine Elms Lane and the pretty illustrations reflect the delusional belief of 21st century developers that a bicycle is a contemporary walking accessory. Just as members of a household tend to share one dog to take for walkies, the plans suggest that each of the 1,860 homes will each have just one bicycle parking space. I hope each parking space will be long enough to at least accomodate a tandem. 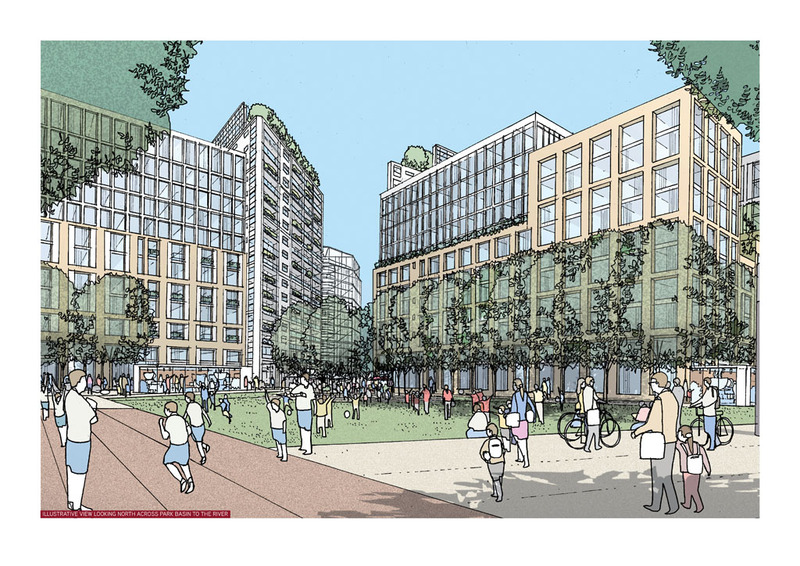 I've got no idea if we'll able to cycle along the Thames Path, or along the Linear Park (or whether it'll be wide enough in places to have a cyclist going each way), or whether there'll be family-friendly cycling infrastructure on the Nine Elms Lane expressway. Will this area be London's tower block version of Amsterdam? Maybe the developers will know. You can ask them between 2 and 6pm on Fri 30/09 and between 10am and 4pm on Sat 01/10 at All Saints Church, 100 Prince of Wales Drive, London SW11 4BD. Tyers Street Linear Park - get stuck in! Your early thoughts are sought by Cllr. Mark Harrison and Chrys, secretary of VGERTA (Vauxhall Gardens Estate Residents and Tenants Association) on the possible conversion of Tyers Street into a long, narrow (hence linear) park. 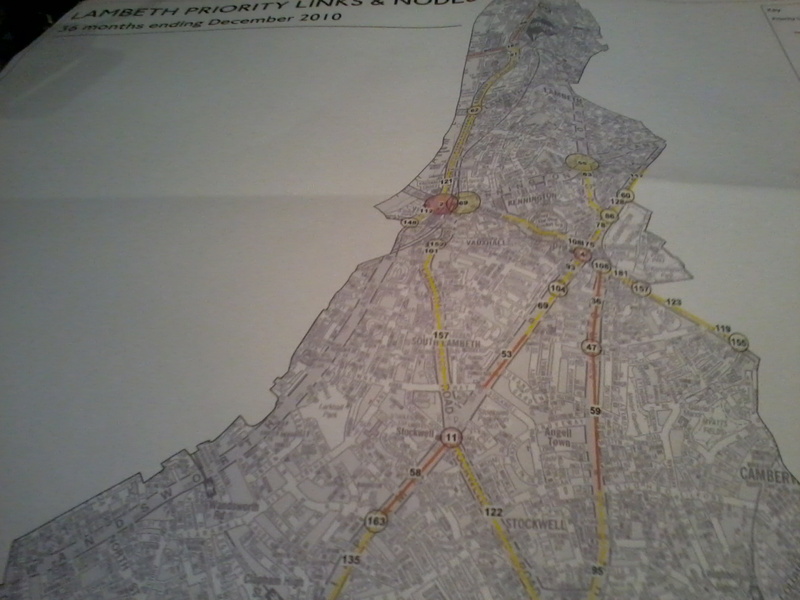 There may be opportunities for new green spaces, cycle routes, artwork, play areas, allotments and fountains. I'm immediately sold on the idea! Tyers Street runs from Kennington Lane, past Vauxhall City Farm, to Black Prince Road, adjacent to the Beaufoy Centre. At last night's Kennington, Oval and Vauxhall Forum there was an introduction to Lambeth's new approach to traffic improvements. Rather than approach one street at a time they're taking a wider area and looking at a range of linked improvements to be made across it. The first of these, if I read the map correctly, is centred on Stockwell, going up to Kennington Oval and Camberwell New Road. It will be a two year project, starting initially with invitation to the local community to identify changes they'd like to see. 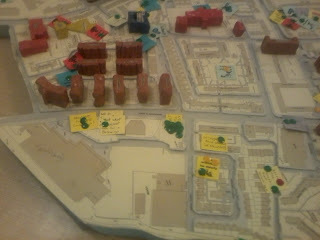 To kickstart the process a model/map of the area had been taken to Stockwell Festival and was at the meeting with a range of tags (eg Make 20mph Zone) you could pin to the map. Others could stick pins into the tag showing support or opposition. Over the coming months there'll be a number of events and ways to feed in ideas, with detailed planning following then the work being undertaken by the end of the second year. Encouragingly 20mph zones, cycle parking, cycle routes and tree planting were the sorts of things that were being dotted all over the map. Let's hope it stays this way. 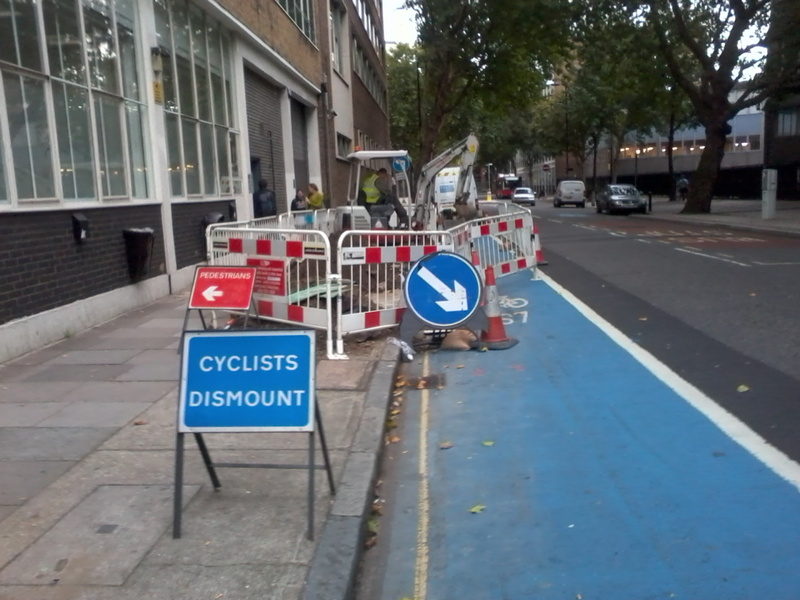 Presumably the sign's put in place on the laughable assumption that cyclists using Cycling Superhighway 7 aren't accomplished at riding in the general traffic. The reality is that, roadworks or not, the superficialhighway requires you to do this for much of the time as part of its compromised design. This Sunday just over Westminster or Waterloo Bridge you can see a Time Trial in the morning (route A), from 11 - 12.30, and the Circuit Race (route B) in the afternoon, from 3.45 to 5.45. I've finally had occasion to nip over Lambeth Bridge and back. I much prefer the wider cycle lane, shown above, going towards North London over the unbelievably narrow predecessor. It's a shame that TfL couldn't take the opportunity to improve the approach to the cycle lane, though I suspect it'd be a larger project than could be encompassed in a resurface and repaint. a) The bus lane to be the correct width to discourage buses from trying to squeeze past cycles. 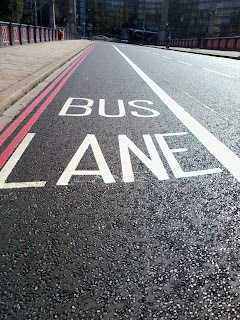 b) The Bus Lane marking must be amended to Bus and Cycle Lane, and should have cycle logos in the middle of the lane to encourage cyclists to take the lane rather than hug the pavement. The cycle logos are particularly important where the private motorist can enter the nearside lane towards the end of the bridge, reminding drivers that they must not squeeze in on cyclists in their lane. c) We applaud not having a feed in lane to the ASL. We look forward to your feedback on the points we have made. 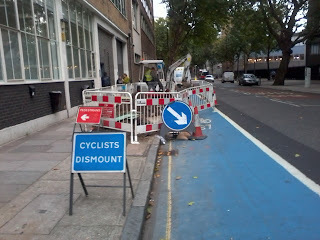 Despite chasing TfL, Lambeth Cyclists didn't receive any feedback or revised drawings before the work was undertaken. The works are done but there are no cycle logos (on this cycling section of the Jubilee Greenway!) 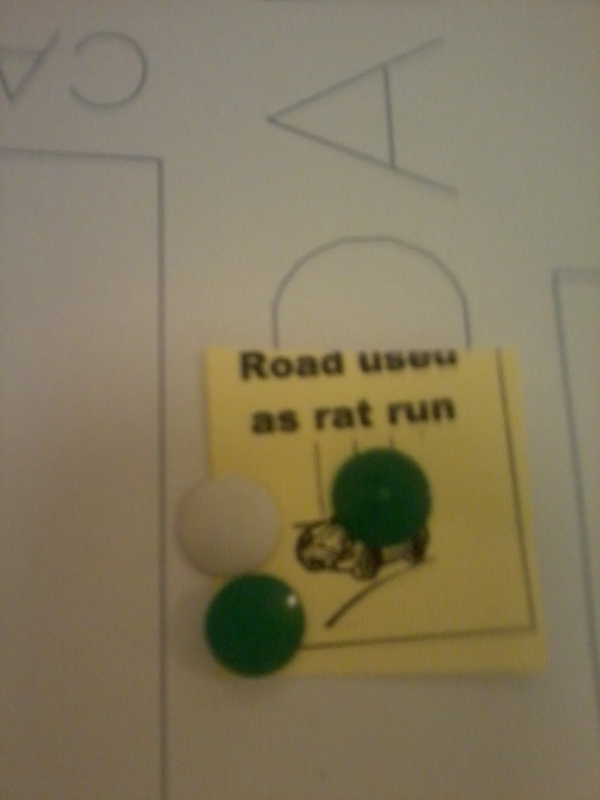 encouraging cyclists to 'take the lane'. Towards the end of the bridge the bus lane ends and general traffic can enter the lane. 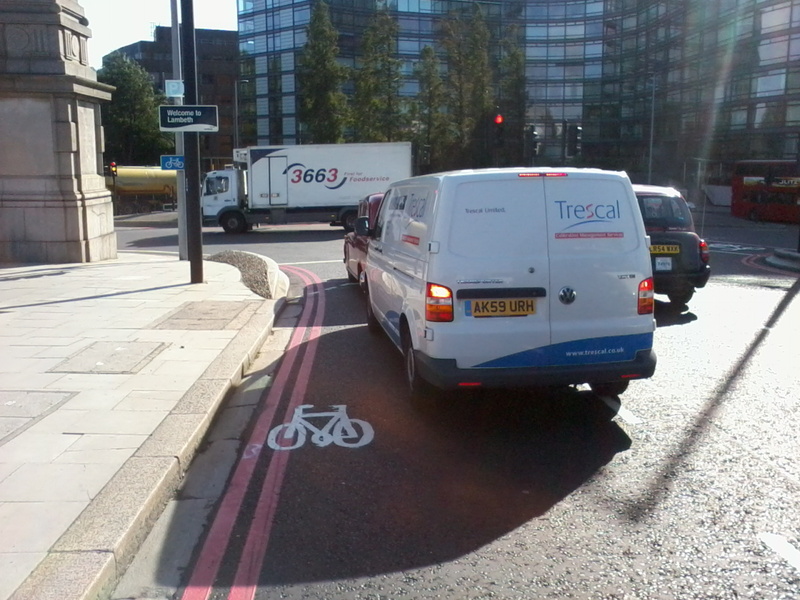 Here TfL have painted cycle logos over the red lines encouraging cyclists to approach the roundabout on the far left even if going straight on or right and suggesting they should be out of the way of motorists joining their lane. Lambeth Cyclists believe the cycle logos should be in the centre of the lane reminding drivers that they are entering a lane where they can expect to find cyclists continuing from the Bus Lane. Finally, below shows why this is not the place that a cyclist going straight on or right wants to be when the lights change. This van driver is indicating left, but a worrying number of left-turning drivers don't bother. I think these works graphically demonstrate how TfL marginalises cycling when they should be going full-out for modal shift towards it. For geeks, below is the correspondence history that suggests TfL's original resurfacing plan didn't even include widening the northbound cycle lane. Shortly before Christmas 2010 I heard that Transport for London intended to resurface Lambeth Bridge between Christmas and New Year. I quickly emailed London Streets at TfL saying, "Please can you let me know whether the works will include widening the cycle lane on the northbound carriageway? If not at this time, is there an intention to do in the very new future?" I received a quick and encouraging reply, albeit one which suggests it wasn't in the original plan, "It now appears the predicted temperatures will be too low for us to carry out the resurfacing works on Lambeth Bridge as planned. We will re-programme this work for when the weather has improved, and we will include the replacement of the failed expansion joints within a re-scoped scheme instruction. We now have a little time in which an assessment of the possibility of a slight widening of the northbound cycle lane can be carried out. We are not currently able to give a date, but if it proves to be possible, we will adjust the width of the cycle lane as part of the resurfacing works." 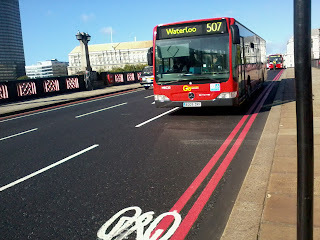 At this point I wrote to Lambeth and Westminster Cyclists, and Lambeth Council suggesting they push for improvement to be made, adding, "I favour getting a full width lane northbound by removing the southbound cycle lane and moving the bus lane across. The southbound cycle lane is dangerous in my view because it too is narrow but also it encourages cyclists going straight on or right at the roundabout to approach in the cycle lane where they are at risk of being left-hooked by vehicles turning left to South Lambeth Road. This bridge forms part of the Jubilee Walking and Cycling Greenway so it is crucial that it is made very cycling friendly." 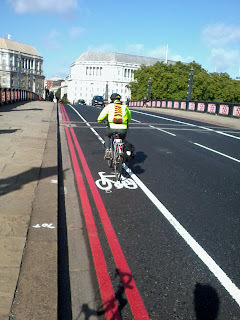 Lambeth Council's Transport Policy Manager wrote to TfL saying, "Lambeth would very much support the comments he has made" and received a reply in late January saying, "The resurfacing project will include amendments to the road markings over the bridge, to improve the width of the northbound cycle lane. I attach for your information the current proposal, which is currently being safety audited (which again suggests it wasn't in the original plan)." That proposal was discussed by Lambeth Cyclists who were particularly perturbed that, while wider, the new northbound cycle lane was shown as Advisory (dotted line) where the existing lane (solid lane) was Mandatory. Mandatory, by the way, in this context means motor vehicles are not allowed in it rather than cyclists have to use it. 1. Can we check that these works are relatively small scale remedial and resurfacing works to the bridge and not part of a full redesign of the bridges layout? Our recommendations are made on the basis of a minor rather than major fix on this understanding. We note the significant increase in cycling traffic across all London bridges (http://cyclelondoncity.blogspot.com/2011/02/2011-more-bicycles-than-cars-will-cross.html) and the need to nurture modes of transport that are greener and less space consuming per head.than the private car. In the near future it is important that the problems with the roundabouts at each end of the bridge are also resolved. 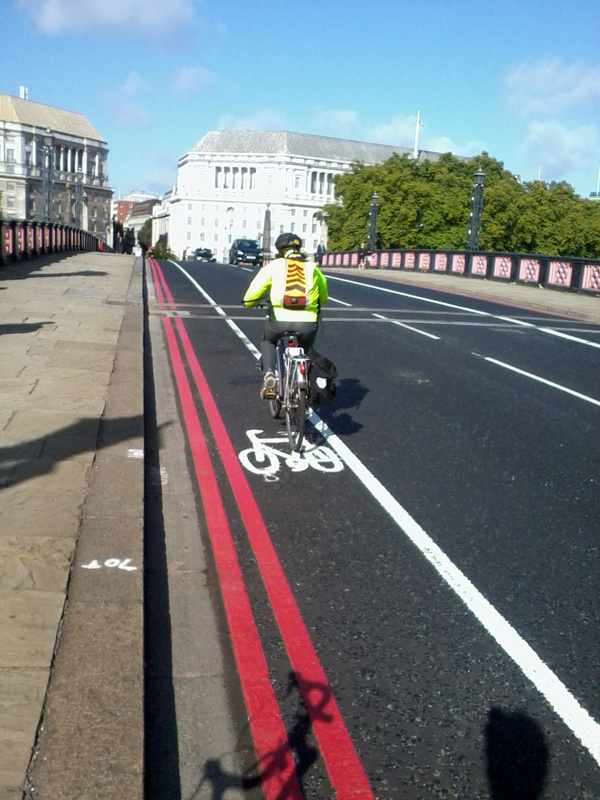 a) The cycle lane towards Westminster MUST remain Mandatory rather than be changed to Advisory as shown. It is absolutely unacceptable for this to become Advisory given there is no frontage (shops, houses), no parking requirements, plus adequate general lane width.
. b) Consideration is needed on how to to prevent motorists cutting into cyclists at the entrance to the bridge as they do at the moment. 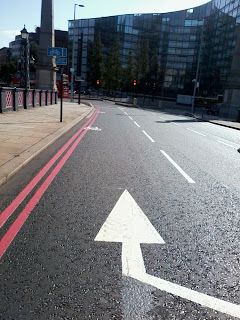 At the start of the1.5m mandatory cycle lane at the Lambeth end of the bridge a tiny bit of segregation is required. The exact length needed can be seen from the length of the current mandatory line that has been worn away by motorists driving over it.This could either be physical segregation or time segregation via the traffic signals having a cycle phase. c) We would like to see the plans showing where the line between the cycle and general traffic lane ends and how the merger of the two is facilitated. The faciliation is needed to avoid the tendency of cyclists to continue to hug the left towards the roundabout; to facilitate cyclists turning right; and to counter the assumption motorists tend to have here that they have right of way over cyclists wishing to merge here. Is there a policy on 'merge lanes' markings within DfT/TfL? How well does Vauxhall Cross function? Last November John McNulty, TfL's Head of Interchange, spoke to Future Vauxhall about remaking Vauxhall - a key transport interchange. One of the points Mr McNulty was keen to make is that TfL considers Vauxhall 'functions well in traffic terms'. Today I learnt that Vauxhall Cross (red circle on TfL's map below) is TfL's top priority node in Lambeth on the basis of 'Sites with the highest collision rate when compared to the average for Central' (presumably inner London). In the 36 months to December 2010 there have been 43 collisions, with seven killed or seriously injured. 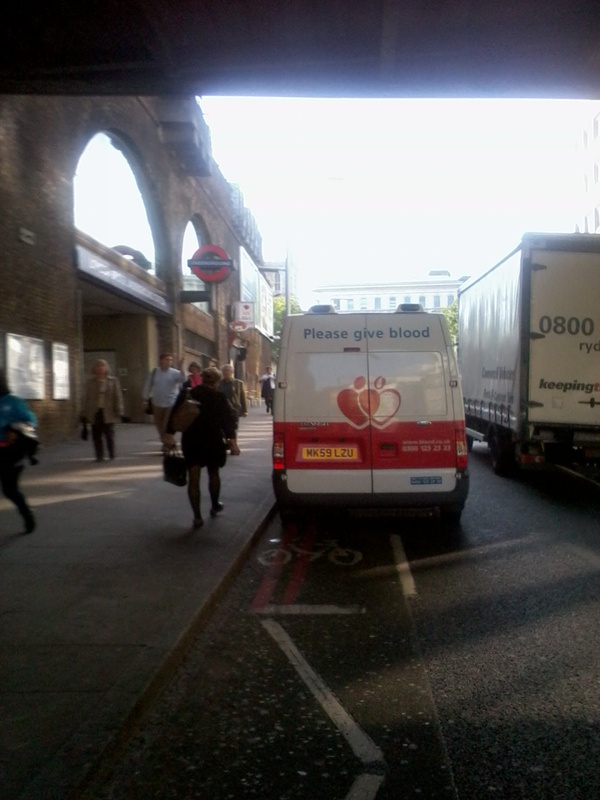 'Please Give Blood' is the appeal on the back of this NHS van (MK59 LZU) parked on Tooley Street outside London Bridge Station with its hazard warning lights on shortly before 4pm today, enticing cyclists to nip out into the general traffic lane. 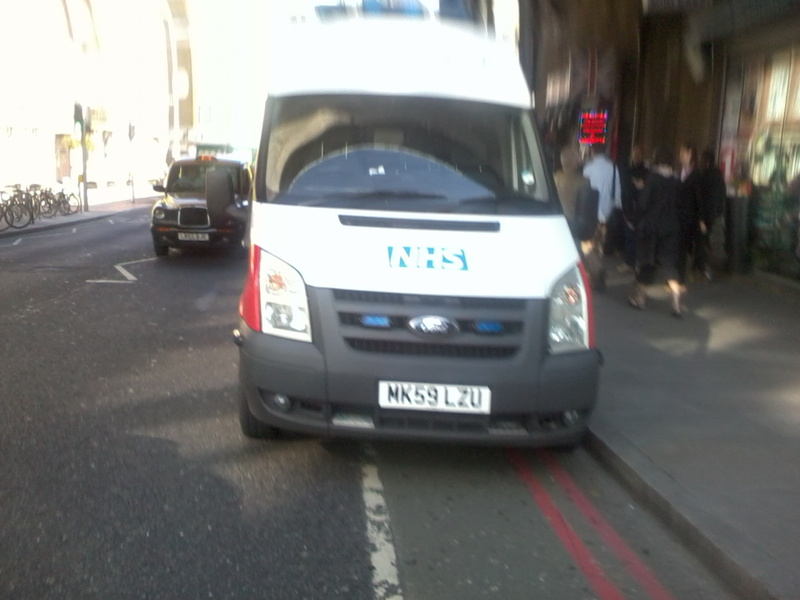 The van's in the mandatory cycle lane ('You MUST NOT drive or park in a cycle lane marked by a solid white line during its times of operation' - Highway Code 140) on a red route marked with double red lines ('no parking at any time'). There is no driver in the van. It may be that the NHS has special dispensations that permit its vehicles to be parked in such a way as to encourage cyclists to mix it with the lorries and taxis. 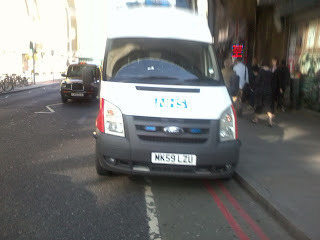 Even if they do I bet there's somewhere else the van could sensibly be parked at London Bridge that doesn't place the vulnerable road user at risk. Maybe that's the intent though - the NHS wish to increase the demand for their services by upping the numbers Killed and Seriously Injured while also discouraging others from healthy lifestyle options that put health care professionals out of work? 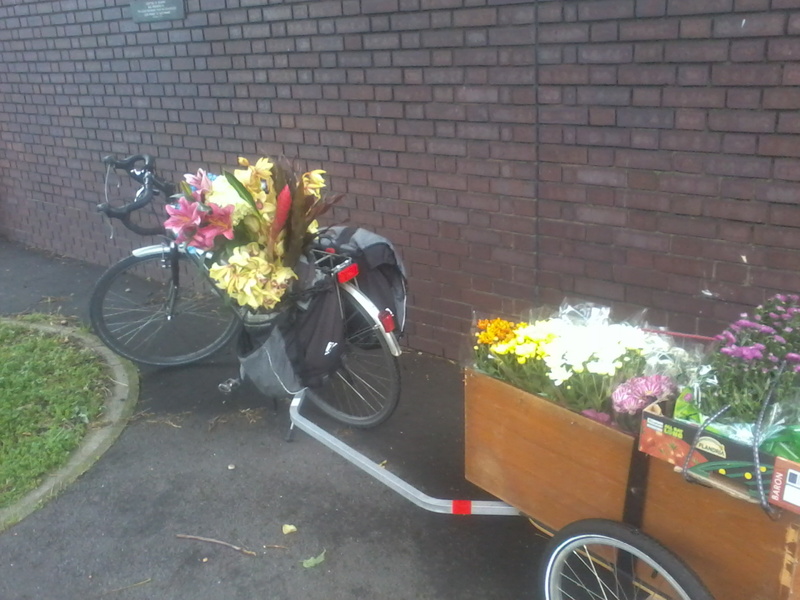 I've not been in London much this summer and missed the Festival Hall's floral ride (not to mention the long-awaited changes to Lambeth Bridge's cycle lane, which I haven't yet had cause to visit). 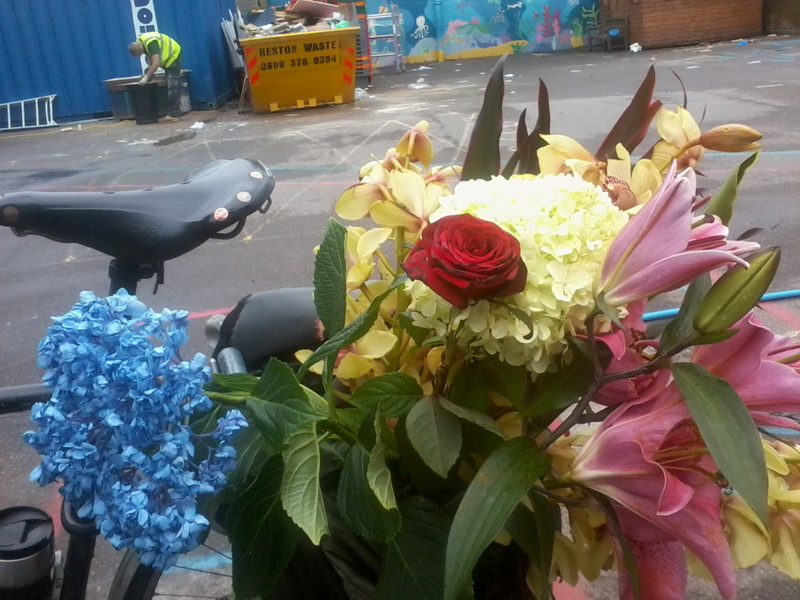 I think I made some amends for missing the floral ride today as I picked up some plants from New Covent Garden Market to deliver to a school down Nine Elms Lane. The trailer is laden with plants en-route to the school's baskets, while the pannier is laden with flowers discarded at the market to adorn our house.